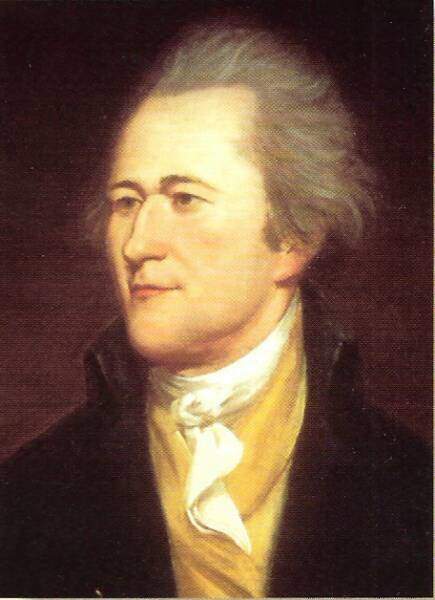 Alexander Hamilton (1755-1804) was an American lawyer, politician and philosopher who played an important role in the development of the new republic. Born in the West Indies, Hamilton was denied the childhood opportunities available to other colonial children because his parents were not married. Hamilton did receive a rudimentary education, something at which he excelled enough to be awarded a scholarship to study in New Jersey. He quickly developed an interest in colonial politics and the unfolding revolution, writing several essays and volunteering for the New York militia. Though barely into his 20s, Hamilton became chief of staff to George Washington. His intelligence, tact and efficiency earned Hamilton the general’s trust and respect. In 1782 Hamilton was elected to the Confederation Congress but soon became frustrated by its inadequacies, particularly Congress’ inability to generate revenue and its lack of coercive power over the states. He became one of the leading advocates for constitutional reform and the strengthening of federal power, playing important roles in the Annapolis Convention (1786), the Philadelphia Convention (1787) and the Federalist lobby for ratification (1787-88). 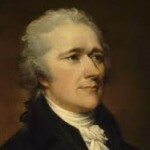 Hamilton later served as the first Secretary of the Treasury under George Washington, before being killed in a duel with vice president Aaron Burr.